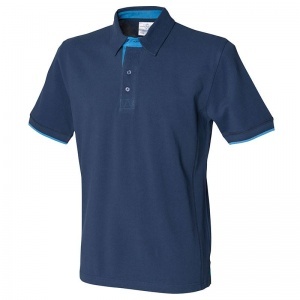 Pique polo with self fabric side panels. Tonal flat lock stitch detail on panel seams. Contrast woven placket and inner collar band. Self fabric collar. Zigzag contrast stitching on placket box. Contrast herringbone tape in side vents. Contrast tipping on cuffs. 4 button placket with dyed to match buttons. 40 cotton. Do not bleach. Do Not Tumble Dry. 2 dot iron. P dry clean. Wash at 40 degrees. Wash dark colours separately. Re-shape while damp. Dry out of direct heat and sunlight. Do not leave folded when damp. Iron on reverse. Wash and Dry Inside Out. Dry out of direct heat and sunlight.